O'Neill Cold Water Classic Canada 2010 - Re-Pete Devries? O’Neill Cold Water Classic Canada 2010 — Re-Pete Devries? Anyone who was standing on North Chesterman beach on that sunny and crisp Halloween Day in 2009 will never forget Peter Devries’ smile as he emerged from the water — loved local surfer, now O’Neill Cold Water Classic Champion. “I’ve see the Great Wall of China. I’ve climbed to the top of the pyramids in Egypt. But I have never seen anything like this,” yelled contest emcee Dom Domic. The crowd roared in response. Grown men and women cried with joy. Fellow surfer, good friend and 2009 contest ambassador Noah Cohen waded fully clothed and without hesitation into the waves with a huge Canadian flag to drape over our hero’s shoulders. Reporters rushed the champion as he made his way to the winner’s podium on the shoulders of adoring friends. Photographers and videographers captured unforgettable images that are still being distributed by media outlets around the globe; images of a small town with a big heart, a town with enduring support for its people and land and a town now filled with pride for their new star. And as Pete hoisted the beautifully carved traditional Nuu-chah-nulth First Nations weapon-paddle trophy into the air and was showered with champagne, the hundreds of locals and visitors who had flocked to the beach to watch him win felt a collective rush of admiration and pride. All of the emotion of that day was captured, along with some extraordinary scenic footage of the Tofino area, by O’Neill’s master filmmakers in “Cold Water Classic Canada: The Documentary” available from Tourism Tofino and online at www.oneill.com/cwc. This 26-minute film features many local personalities and showcases the majesty of Tofino’s beaches and forests. Tofino is once again welcoming the O’Neill Cold Water Classic Canada surfing competition starting October 9 and running through October 15, 2010. A World Qualifying Series 6 Star, the O’Neill Cold Water Classic is Canada’s only professional surfing competition sanctioned by the Association of Surfing Professionals (ASP) — the foremost governing body in professional surfing. As many as 144 professional surfers from around the world will be in town to compete for $145,000 US in prize money. Pete Devries and Noah Cohen will be joined by local Tofino surfers Raph and Sepp Bruhwiler in the competition which is already getting international media attention. As it did last year, the success of the contest will rely on a mobile format – moving from beach to beach to take advantage of the best surf and wind conditions on offer. In addition to beaches within the District of Tofino (North and South Chesterman Beach, Cox Bay, MacKenzie Beach), O’Neill has received special permission from Parks Canada to move the competition to Florencia Bay and Long Beach within the Pacific Rim National Park Reserve if conditions are more favorable. Domic pointed out that this year’s contest has even more talent, with “wonder kids” Eric Geiselman, John John Florence and Julian Wilson along with Josh Kerr, Yadin Nichol and Mitch Coleburn all vying to make a push for the World Tour “elite 32.” Additional drama exists with World Tour surfers who didn't make the mid-year cut like Tanner Gudauskas, Nate Yeomans and Ben Dunn, plus all the former World Tour surfers, and all the returning competitors who know now what to expect. 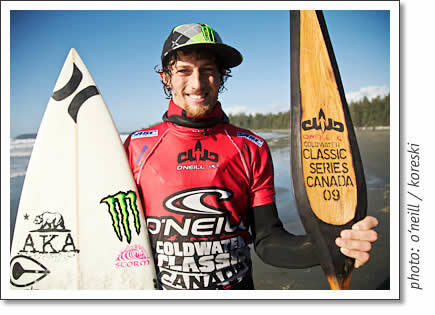 Excitement is definitely building as the O’Neill Cold Water Classic Canada approaches. 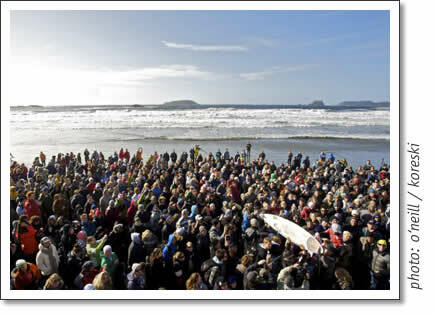 Tofino would love to see a “re-Pete.” But like all of us who love the sport of surfing in Tofino, we hope most for good swell and favourable weather so we can all witness the best surfers on the planet showcasing themselves in our waves. For more information about the O’Neill Cold Water Classic Canada including a list of contestants, event schedules, daily contest updates and Surf Shuttle schedules, visit the Official O’Neill Cold Water Classic Canada website. Lynda Kaye is a writer and marketing consultant living year-round in Tofino. Marc Fuller is the O’Neill CWC Canada Event Coordinator, surfer and an adventure designer residing in Ukee. O’Neill Cold Water Classic Canada 2010 article about the hopes of Tofino’s surf community for a ‘re-pete’ of last year‘s win by Tofino surfer Pete Devries. Written by Marc Fuller and Lynda Kaye for Tofino Time Magazine in October 2010.